This is the time when we get a little worried, why? It’s that season…cold and flu season. What can you do? 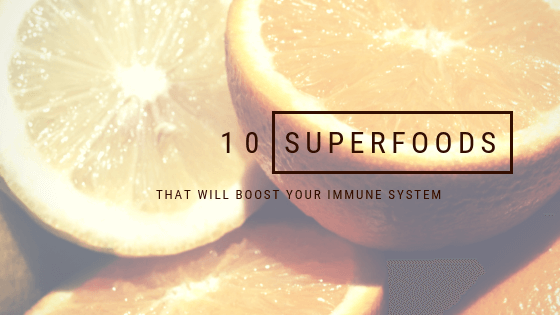 Eat more superfoods, 10 superfoods to be exact that will boost your overall health including your immune system. Okay, first of all is “superfoods” really a term? It’s not an official term or label like USDA certified, but hey it’s catchy and there is a reason why we (dietitians) like to use it. Foods that are packed with a dense concentration of vital nutrients, vitamins/minerals along with antioxidants, good fats, healthy enzymes and other health related properties that help treat and lower the risk of specific diseases are given that catchy phrase superfoods. So are you wondering if you eat superfoods will you feel like superman or superwoman? In this case it could be a definite YES since we’re talking about fighting off those terrible villains called cold and flu! Let’s just jump right into the good stuff. How to keep your immune system in tip-top shape not just during cold season but all year long. CITRUS: first thing everyone does when they get sick is practically overdose on vitamin C. How about this, how about including lots of natural vitamin C in your diet before cold and flu hit? How…try adding in a variety of citrus fruits into your diet like oranges, lemons, limes, grapefruit, tangerines and clementines. Vitamin C works to encourage production of white blood cells and in turn these cells help us fight off infection. GARLIC: either you love it or you hate it. I’m hoping you love it because garlic is going to help you kick those germs to the curb. Those pesky colds and flu are less likely to win because of the allicin found in garlic. Sulfur containing compounds from allicin give garlic its medicinal properties. They’ve shown to boost the disease fighting response of some types of white blood cells. So when the body encounters viruses like colds and the flu guess what, yup those specific white blood cells are going to attack to try and keep you healthy! Of note, heat can decrease the benefits of allicin so we need to be careful, what can you do? First, crush or slice all of your garlic before you eat it. This actually boosts the allicin content. Second, let your garlic stand for 10 minutes before introducing it to heat. Third, use LOTS of garlic. Typically more than one clove per meal, when you think about this it’s not that difficult, am I right? GREEN TEA: antioxidants called flavonoids are packed in both green and black teas. But green tea really excels when it comes to EGCG (epigallocatechin gallate), let’s just stick with EGCG, right? This is another antioxidant with mega powers to enhance the immune system. Talk about having super powers. In black tea this antioxidant is partially destroyed because of fermentation, but green tea is steamed and preserves the EGCG. Green tea doesn’t get its super powers just from EGCG but also a specific amino acid called L-theanine which is thought to assist in the making of germ fighting compounds in your T-cells. GINGER: for as long as we can remember ginger has been used for multiple medicinal purposes in the Asian culture, and for good reason. Ginger contains a bioactive ingredient called gingerol. Now this is a superfood because not only can it help lower the risk of a variety of infections (aka cold and flu) it can also help fight against cancer, lower LDL cholesterol, provide pain relief during menstruation, it can help relieve chronic indigestion and nausea and the list goes on. So whatever you do incorporate some ginger into your diet today by adding it to soups, smoothies, try some ginger tea or make lemon ginger energy balls. I’ll let you take it from here. TURMERIC: several studies show that turmeric provides major benefits to both the body and the brain. Curcumin is the active compound in turmeric that provides both an antioxidant and anti-inflammatory effect keeping your body healthy. The body doesn’t easily absorb Curcumin on it’s own. So next time you use turmeric pair it with black pepper or fats so your body can put it to good use. If you’ve never tried a golden turmeric latte your missing out. AVOCADO: remember, this is a fruit and it’s bursting with nutrition. Fiber, vitamins, minerals and healthy fats are the nutrients that make up avocado. The most prominent fat in avocados is oleic acid which is linked to reducing inflammation in the body while also playing a role in immune function. Have a little avocado everyday and reduce your risk of heart disease, diabetes, metabolic syndrome and certain types of cancer. If you need an idea on how to incorporate avocado into your diet here is a great recipe on how to create a tasty summer slaw (but you can eat this any time of the year). CHIA SEEDS: these lil’ guys are one of the most healthy foods we can incorporate into our daily diet. Only goodness is popping from these tiny seeds. Chia means “strength” and for good reason. They are packed with fiber, high quality protein, healthy fats (including omega -3s), vitamins (including a decent amount of vitamin C), minerals and antioxidants. All this goodness can lend a hand in boosting your immune system, decreasing heart disease, blood sugar levels, chronic inflammation and improve bone strength. So go ahead and grab yourself some chia seeds today. If you’re not quite sure what to do with them might I suggest you sprinkle them on kefir, add some to a smoothie, jazz up your cereal, make chia pudding or add them to baked goods. SPINACH: this leafy green is rich in vitamin C but it doesn’t stop there it’s got a variety of antioxidants and beta carotene, including many other powerful nutrients. This may increase the infection-fighting ability of your immune system giving cold and flu the one-two! Don’t overcook your spinach as this could decrease all it’s goodness. Try lightly sautéing it with garlic, or try a wilted spinach salad, cook it up in a veggie hash, add it to your smoothie or even make pesto with it. ALMONDS: although vitamin C is king when it comes to fighting off colds vitamin E is key to a healthy immune system. Almonds are chock full of vitamin E and healthy fats. If you eat about 23 almonds (which isn’t hard at all) you’ll get about 50% of the recommended daily amount of vitamin E in return. What an awesome gift! SWEET POTATOES: you know these root vegetables are exploding with nutrients, their color gives them away. Of course vitamin C and vitamin E are two of these nutrients. Sweet potatoes help boost your immune system so you can stay healthy all year long. Sweet potatoes can prevent vitamin A deficiency, improve blood sugar regulation and reduce oxidative damage to our cells. Now those are great reasons to be eating sweet potatoes. And hey, check out my recipe for sweet potato breakfast cookies here! The most important thing is to have a well-rounded, heavily plant-based diet. Including whole, fresh foods into your nutrition plan is what your body needs to maintain a healthy robust immune system. The above foods can give you the BOOST you could be looking for. If you’re not sure how to include these immune boosting foods into your daily diet check out Pinterest. Search for recipes to get ideas and even new ways to include these foods into your diet. Pinterest can be your best friend! I’d love to know how you keep your immune system in tip top shape or if you try one of the suggestions above. Drop a comment below and let’s chat.